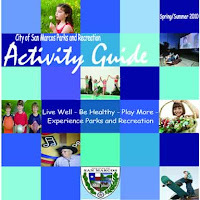 SMGA is thrilled, again, to have a full-page spread in the 2010 Spring/Summer San Marcos Parks & Recreation Activity Guide. Pick up a copy at many places around town or view it online. Be sure to share it with your friends and neighbors. Some of our upcoming hikes are listed in the Guide. Soon you will be able to register to attend a hike using RecConnect, the city’s online sign-up tool. Of course you are always welcome to hike with us without pre-registering.